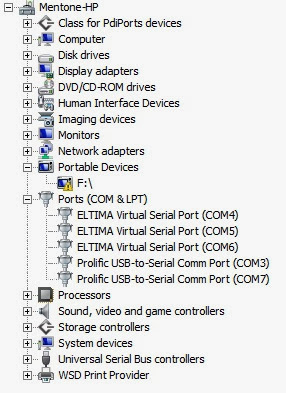 I use many virtual COM ports. The microHAM USB Device Router managers COM4, COM5, and COM6 with no risk of conflicts. However, when I install a serial to USB converter, many of the drivers for such devices will not "pay attention" to existing COMx ports, and as a result, assign a COMx port that has already been assigned. The only "symptom" is the devices in conflict simply don't work. Drilling down you will find the following dialogs. In my case, the hardware now assigned to COM7 was initially assigned to COM5 by the driver. Notice that COM5 was already used. As a result, the COM5 and COM7 devices simply did not work. Right click on the conflicting COM point and you will reveal the Properties menu. Clicking on Properties, will reveal the dialog shown immediately above. Click on Advanced will reveal the dialog the second dialog which allows you to change the designated COMx port. The dialog above shows this pull down box. Once I selected COM7, a unique COMx, both devices worked properly. Thanks Carl, this information is good to have.